Rep. Devin Nunes says his committee will look into report that the NSA spied on Netanyahu after it was supposed to limit such activities. The chairman of the House Intelligence Committee, Rep. Devin Nunes (R-CA) said Wednesday his committee will look into a report that the United States spied on Prime Minister Binyamin Netanyahu and in the process swept up communications with Congress. Speaking to The Associated Press, Nunes said he had asked the director of National Intelligence and the head of the National Security Agency (NSA) to come to Capitol Hill next week to brief lawmakers on the matter. The request comes following a report Tuesday in the Wall Street Journal which revealed that even after President Barack Obama announced two years ago he would limit spying on friendly heads of state, the NSA kept watch on Israeli Prime Minister Benjamin Netanyahu and top Israeli officials. 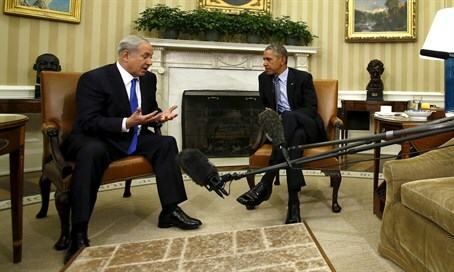 The report said that the spying was done so that the United States could monitor Netanyahu’s campaign against the nuclear deal between Iran and world powers. In the process the agency caught some conversations with U.S. lawmakers, according to the Wall Street Journal. That is something that would typically be reported to top congressional leaders and the heads of the House and Senate Intelligence committees, but Nunes said he recalled receiving no such notification. He said his goal would be to "get the facts" about the situation. "We're going to play this right down the middle and determine whether or not somebody did something wrong," Nunes told AP by phone from California. The White House declined to comment on specific intelligence activities carried out by the U.S. But White House officials said the U.S. doesn't spy overseas unless there's a specific, validated national security reason to do so, emphasizing that the principle applies both to world leaders and regular citizens. Earlier on Wednesday, Likud ministers responded angrily to the report and demanded that Israel protest Washington’s action. "If the information that was published is shown to be true, Israel should submit an official protest to the American administration, and demand that it stop all activity of this sort," Transportation and Intelligence Minister Yisrael Katz stated. Immigrant Absorption Minister Ze'ev Elkin said the report highlighted the hypocrisy of the White House in its harsh treatment of convicted Israeli spy Jonathan Pollard. "Precisely on the background of the spying, in opposition to the official declaration that they stopped listening in on friendly states, their stubbornness on the case of (Jonathan) Pollard, the limitations on him and the refusal to bring him to Israel seem even more unacceptable," Elkin said. Netanyahu's office, as well as the spokesman of the foreign ministry, declined to comment on the report.